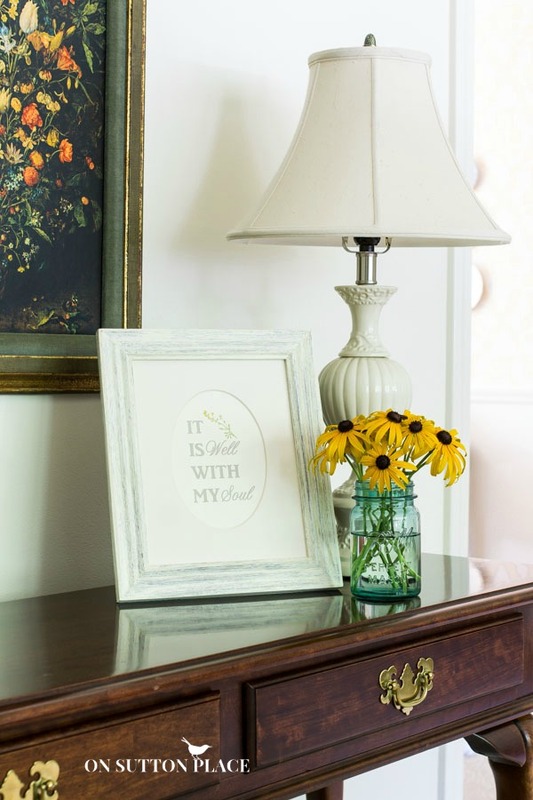 Hello everyone…I’m here today with a simple but very meaningful printable to share with you. I love the story behind these words. Just reading them helps to push the doubts away and calm any turmoil inside you. 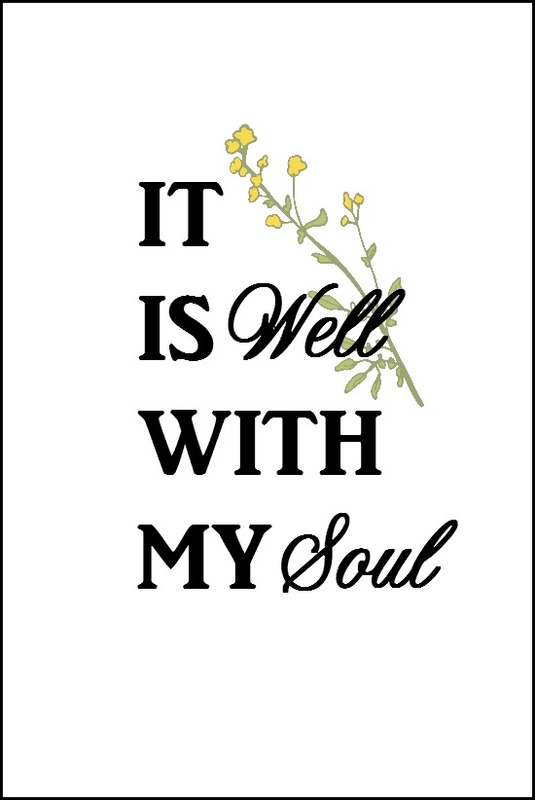 It Is Well With My Soul is a hymn written in the late 1800’s by a man who suffered unspeakable loss and heartbreak. His name was Horatio Spafford and just reading his story puts things in perspective. I’ve heard this song in church my whole life but never knew its story until recently. The fact that this man could lose so much that was dear to him, and still see the bigger picture is amazing. I made the printable as a reminder to myself to be still and know that God has a plan…that everything happens in His time, not mine. I’m offering this printable in two colors just to give you a choice. The grey one goes nicely with my Inspirational Free Printables that I posted a few months ago. If you need a small grouping of wall art this would be a budget-friendly way to get something new. I switched out the Live In The Moment printable for this one. I used the same frame and mat so it didn’t cost a thing. I like being able to change things up once in a while but I also need to re-use things I already have. This was the perfect way to do both. Thank you for stopping by…and I hope you have a perfect weekend! Thank you for the free printable. I love it! One of my favorites….thank you for sharing, Ann! Thank you for this wonderful reminder, we are so blessed. And the rest of that story is, M/M Spafford ended up in a commune in Jerusalem, awaiting end times. Theirs is a terrifically interesting life. What a beautiful printable Ann! Such meaning and it’s fun to change them out with your own personal art. Thank you for giving the print this day. I almost wrote in Swedish. Where did that come from?!! I felt moved seeing his handwriting as I clicked another link. I’d heard the details before but it moves me even so each time. My dear friend and I have a necklace, hand made by a crafts woman in San Luis Opbispo, CA . I bought mine when I recovered after SCA. And to my friend as she and her spouse and kids left for the mission field. Just came across your website on Pinterest and am enjoying it immensely! So nice to know that you also believe that God is in control and has a plan for our lives! Amen! Thank you for taking the time to comment Sherry…glad you stopped by! A favorite hymn and story and you have captured it beautifully. You are the best Glenda…thank you! 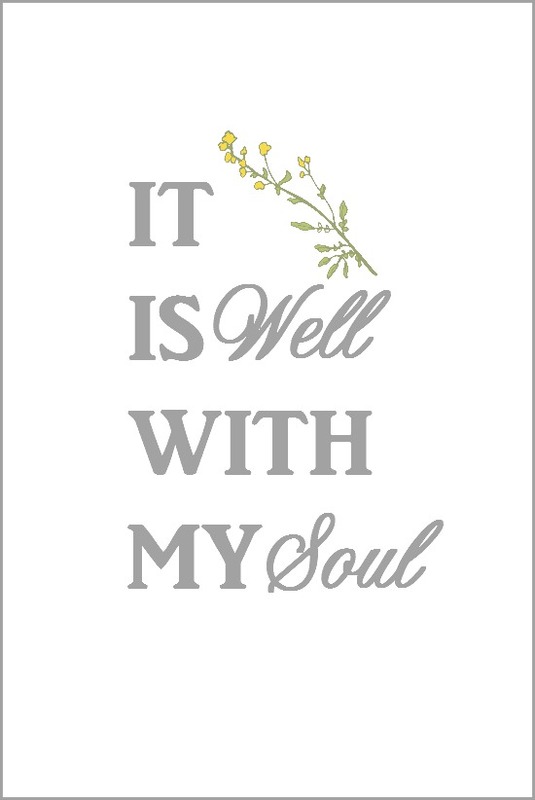 Love the graphic for one of my all-time favorite hymns. Thank you! Ann, I always look forward to your prints! Each one of them is beautiful & so inspirational! Thank you so much for offering them to us! I do so enjoy your sharing and loving spirit. Thanks so much for the blessing! What a nice thing to say Sue…thank you for taking the time to comment. Enjoy the rest of the weekend! I was just thinking about this hymn last week! In fact, it hummed along in my head for several days. 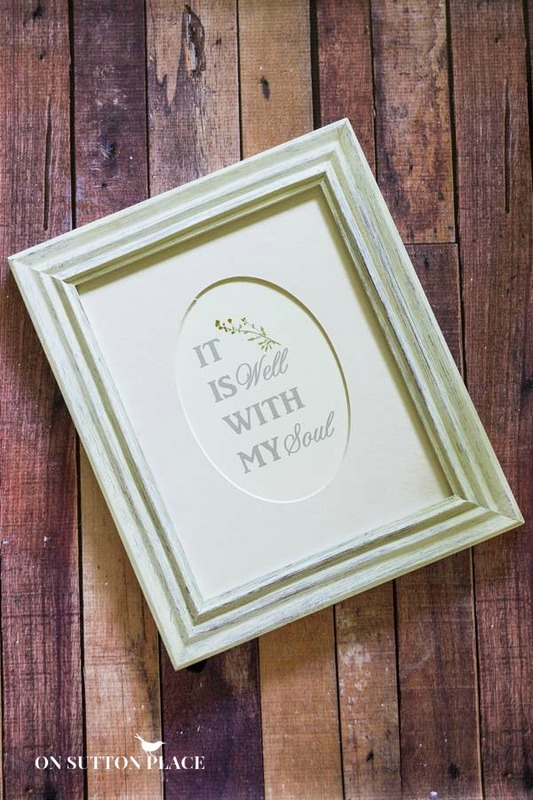 :-) Thank you so much for creating such a beautiful printable to go along with such an inspirational song (and message).